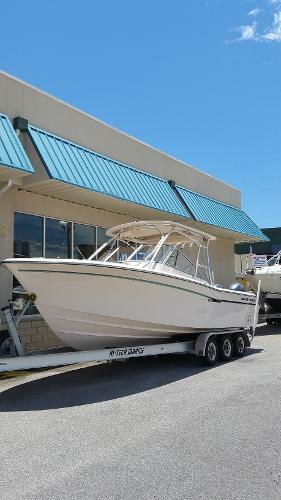 2017 Grady-White 275 Freedom 2017 Grady-White 275 Freedom powered by twin Yamaha F200 XCA engines. 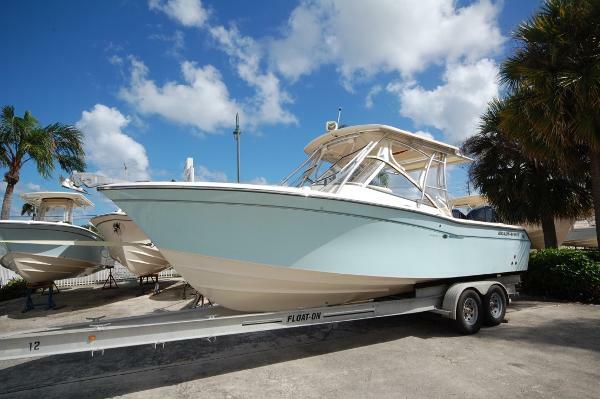 This is an elegant, comfortable cruiser that can also fish hard and is not afraid to get dirty. There is a wealth of shade under the large hardtop, lots of cushioned seating, and creature comforts galore. 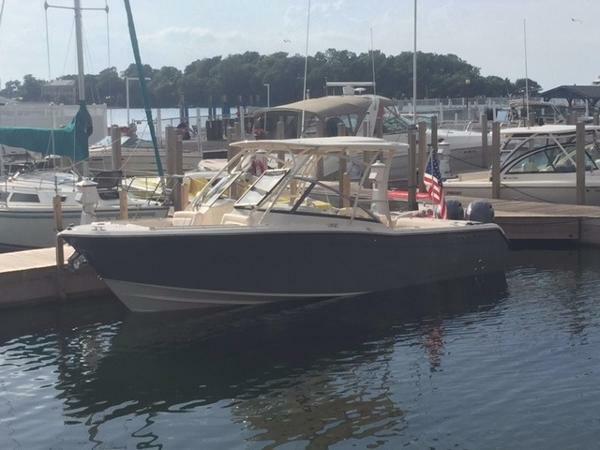 This model is known for a big boat ride in a package that is easy to store and maintain.Options include a sand hull color, side cockpit step, deluxe bar with corian countertop, sink, and storage drawers, ivory front and side curtains, and a ski pylon. Call Cannons Marina today to set up a showing! 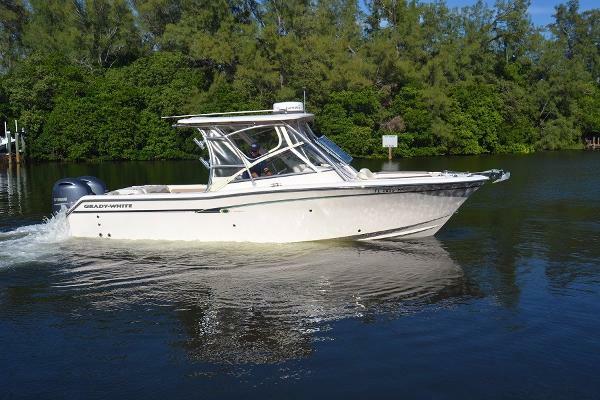 2015 Grady-White 275 Freedom Here is a nearly new 2015 275 Freedom Grady-White. This is the most popular model they sell right now and it is loaded with features and has warranty to 2020 !! The dual console is powered by the new lighter F200 Yamaha four strokes with electronic controls that push this boat to 50mph. The boat is just plain luxurious, thake a look at all the nice little touches throughout. The boat has a Hardtop with full 360 degree enclosures, Multi color lights and amd a custom made rocket launcher rack. The drive helm and passenger lounge are both power operated, The helm has a flip up cushion to drive and the passenger lays flat or is a back to back. There is a folding seat in the rear and forward seating in the front with storage below. 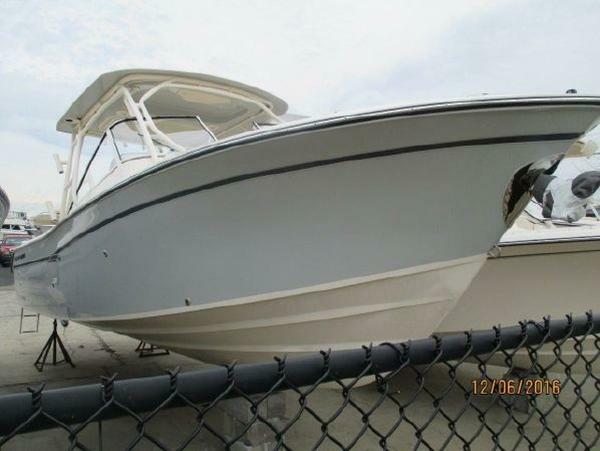 The front also has block off panels and a bow cover for inclement weather.There is a sink in cockpit, full enclosed head with rod storage, live well and fish box in transom, fresh and raw water wash downs, and a table for the bow. 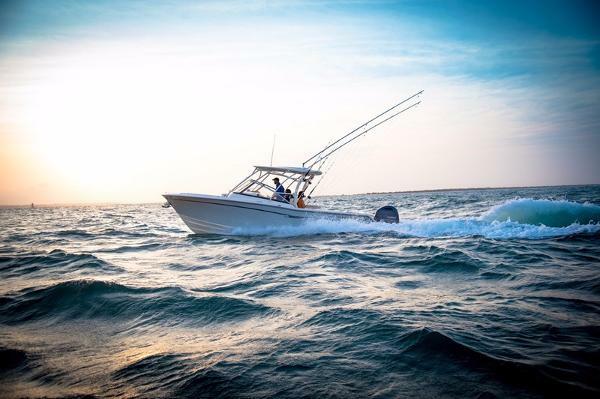 The boat has a GArmin 7" GPS/fishfinder, VHF radio, Fusion stereo with two remotes, Bennet trim tabs with indicators, and a Lewmar electric anchor windlass. This boat is clean, clean, clean. Save thousands over a new one and this one is here ready to go right now! Trailer is available extra. 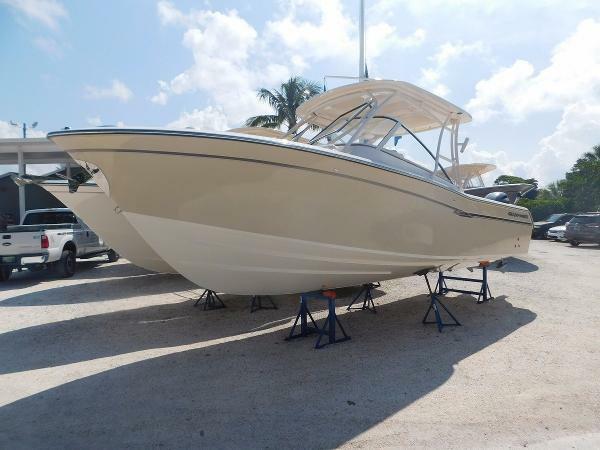 2014 Grady-White 275 Freedom 2014 Grady-White 275 Freedom with twin Yamaha F200 engines. This is a very clean,nicely equipped, low hour boat. The engines have only 58 hours and have the extended warranty until 2019. The boat is equipped with an electric Sure Shade aft top. 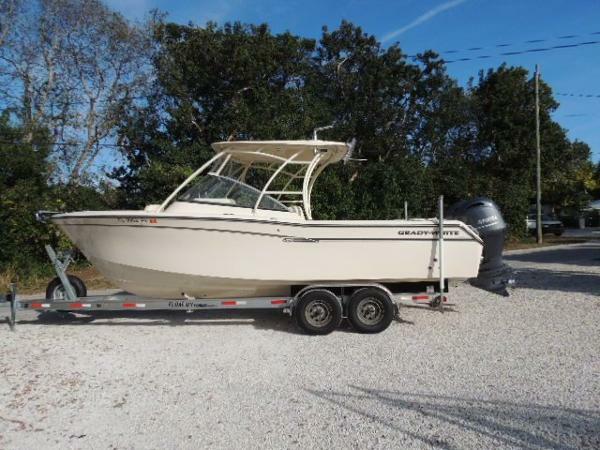 The electronics include a Garmin 7212 GPS/Plotter/Fishfinder, 24 mile Garmin radar, and a Garmin 200 VHF radio. Other options include front and side drop curtains, bow pulpit with anchor windlass, an electric flush toilet, livewell, and leg mount rod holders. The 275 is the largest Grady that can still be easily trailered and fits into most rack storage slips. It provides a big boat feel with the legendary quality and ride of a Grady-White. 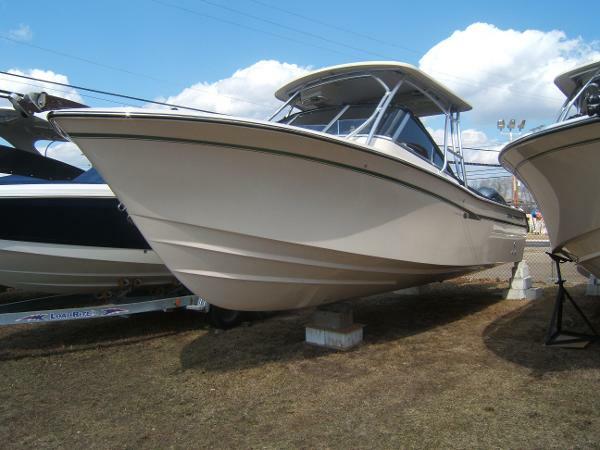 This boat was lift kept, shows like new, and is going to give big savings over a new boat. Call Cannons Marina today for more information. 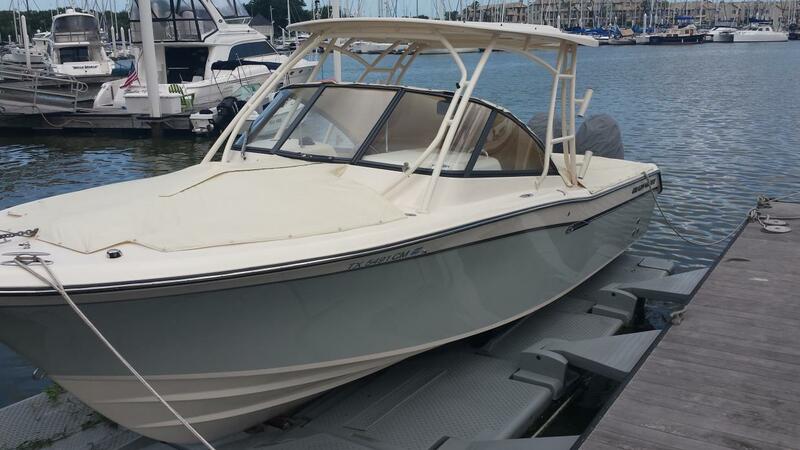 2015 Grady-White 275 Freedom New 2015 Grady-White 275 Freedom dual console with (2) Yamaha F-200 HP 4-strokes, Digital, Hard Top, Hard top front, side & aft covers, Bow cover, Cockpit cover, Electric folding port sleeper seat, Driver side wet bar w/electric seat w/flip up bolster, sink & storage, Marine head (Electric flush), Anchor Windlass, Live well, Salt water washdown, Cockpit bolsters, Forward bolsters, Cockpit shower, Stereo, Hydraulic steering w/tilt wheel, Trim tabs, Bow table, Shore power w/Battery charger,Sand colored Hull, Loaded.